I'm finally back from my 2-week romp through Austria, Hungary, and Croatia. School is upon me for the first time in 6 weeks, and there's definitely a readjustment period that I need to get through. Still, I can't help but enjoy it since it's my last month and a half in London. Now down to business. I'm not sure if I can actually summon the will power to summarize the happenings of the trip in one go. So, as they say, a picture says a thousand words. Go to my Picasa to see all the albums or click individually below. 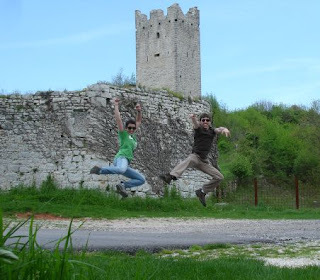 Above is a picture of Jared and I as we got a little picture happy at the ruins in Dvigrad, Croatia. As it said in our guide book, you can really let your imagination run wild. There are no signs, no gates, no fences, no educational information of any kind. All we knew is that it was abandoned due to plague in the 16th century. We walked on walls dating back to the 15th century and we actually climbed into the church of St. Sophia. We were the only people in Dvigrad at the time (hurrah for low season! ), which made it even more surreal. Ok, enjoy the photos.